Business Advertising and Public Relations Opportunities Through the CLS Give Back Club! 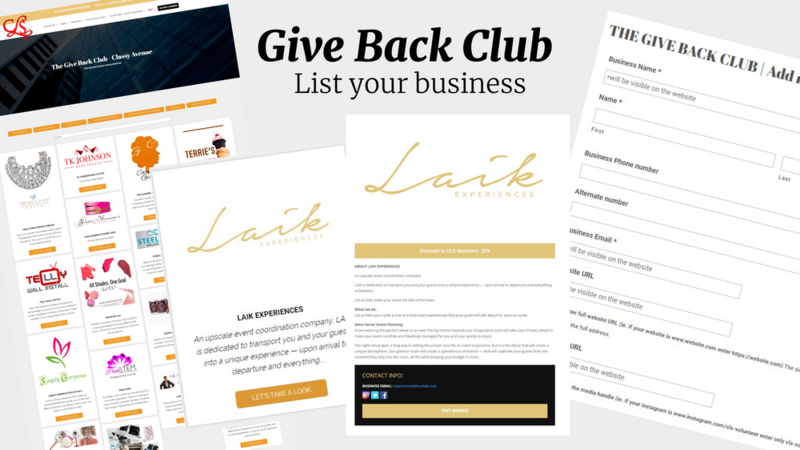 Classy Living Society introduces the Give Back Club – an amazing platform to list your business, give back to the community through your business, enjoy the benefit of expanding your reach and enhancing your public relations profile! In an endeavor to support women in business and women entrepreneurs, CLS invites you to become a member of the Give Back Club, where listing your business gives you the benefit of MAXIMUM EXPOSURE through our online virtual store. Enjoy the public relations advantage that being known as a business that gives back can offer! Allow CLS to assist you with an easy and innovative way for your business to thrive and flourish even more! For a monthly fee of only $12.00, take your business to next level greatness! That’s not all! 100% of your monthly Give Back Club fee will be used to purchase donated items to present to select nonprofit and community service organizations nationwide. For example, 100% of the proceeds can go toward the purchase of toiletry and make-up kits for domestic violence survivors living in a shelter at Valentine’s Day! It is our way to innovate how entrepreneurs interface with their customers, as well as provide a platform for small businesses to give back to the community! It’s a win-win situation for all involved! Have questions about the Give Back Club? Please send your inquiries to Bizzone@cls-Volunteers.org.